Heavy rainfall and high water levels caused a cabin to get caught in a current and then pushed down the Peel River in the Northwest Territories. The runaway cabin came from Fort McPherson, N.W.T., in the Beaufort Delta. It was caught in a current after the rainfall and was pushed all the way past Aklavik, N.W.T., which is about 100 kilometres away from Fort McPherson. 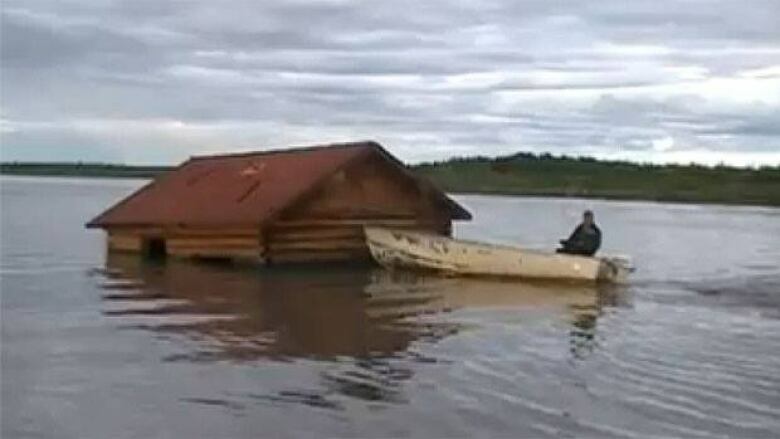 Earlier this week, some Aklavik residents tied the cabin to the shore. However, the current was so strong that it broke the rope and, once again, the cabin floated away. Local hunters and trappers built the cabin. No one was in the cabin at the time, and no injuries have been reported as a result. This isn’t the first time the cabin has cut loose. Last year, high water moved the cabin on to a muddy riverbank about 100 kilometres upstream of Fort McPherson. The cabin slowly made its way down the Peel River. An earlier version of this story stated the cabin was floating down the Mackenzie River. The cabin was instead seen on the Peel River.